Well yes this is correct but aren’t we supposed to be wrapped up in a beautiful package looking the best that we can be??? With 70 sleeps until Christmas we need to get cracking …and on the days that we aren’t going out for dinner or being invited out for a celebratory lunch we need to eat smart. All of us have our special diet up our sleeve which we think works best for us. Some of us go for high fat low carbs, others for high protein low carbs, others for high fiber and others simply despair with counting calories and wonder how they will manage to fit in a few glasses of wine or champers whilst thinking about a lighter and smaller person standing in front of their mirror. I am not going to tell you what to eat or how, I can only share with you what works for me and my go to eating right that works for me with my weight loss. I do not count calories nor follow a set regime. I LOVE FOOD — there– I said it — I ALSO LOVE CHAMPAGNE — ok I have said that too! So with Christmas around the corner and we all want to look our best for that special someone in our lives then we have to take action NOW. There is absolutely no point in getting on the scales day after day and not seeing the numbers decrease …only you /me are responsible for our own actions — so if you are on the countdown to Christmas catch-up, kick start your new look to feeling great today. We all know what we can do we just need a gentle push in the right direction to move forwards thus putting our thoughts into play. A couple of ideas for your breakfast and lunch are to go towards an Asian or Mediterranean style diet…variety really is the ‘spice’ of life, so make whatever you eat interesting — bland—‘spland’ (yes I made up that word just to see if you are still reading) 🙂 Spicing up your life with interesting spices and if possible picking fresh herbs and incorporating them into your meals not only looks good but tastes great! Take inspiration from cook books and then go off piste and do what works for your body. See a Kinesiologist and get your muscles tested up to see what food types are good for your body — obtaining nutritional information is a great thing to do —- with knowledge you can move forward and allow your body to be the best it can be. 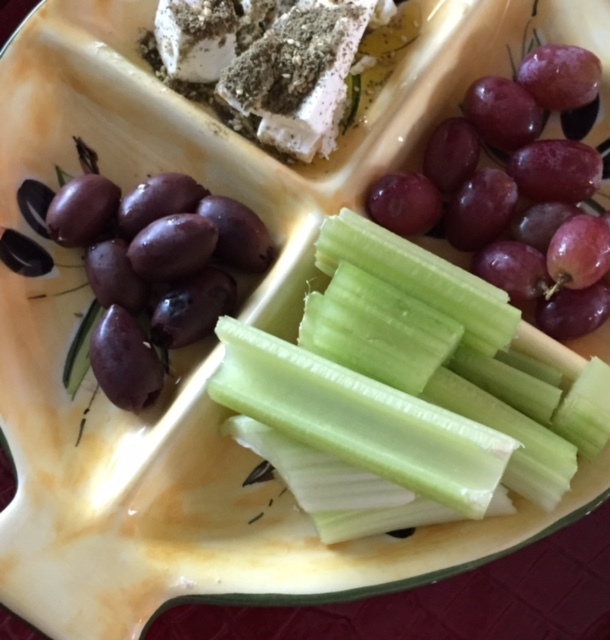 Mediterranean / Arabic fusion breakfast of Feta with Zaatar and olive oil, Kalamata olives, celery and grapes. 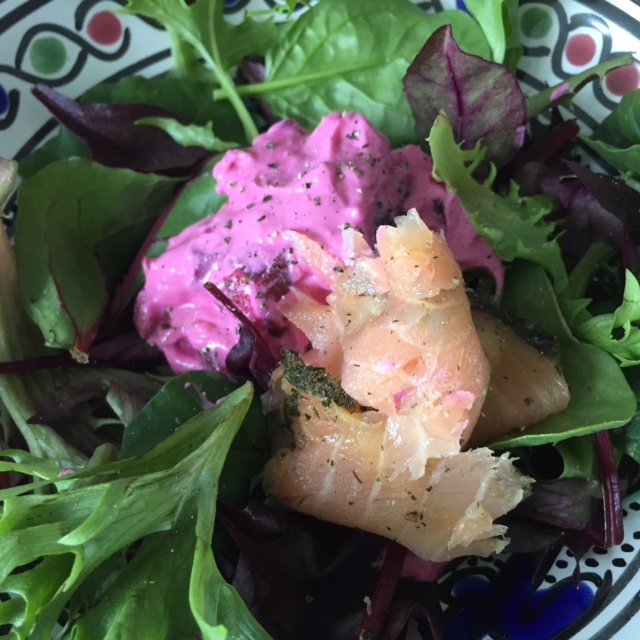 Fresh spring leaves with smoked salmon salad and beetroot tzatziki. Looking forward to hearing how you are all getting on. Love these blogs. This was particularly inspirational regards weight loss as I’m getting into the Christmas countdown diet zone. Great ideas thank you. Do check out my new blog post as it may inspire you again. Hope you are still having fun with your blog.